Libraries are not a surfer’s natural habitat, and good surfing books are on the endangered list. Thanks to the dedicated work of a few intrepid surfers and eloquent wave enthusiasts, there are few rare surfing reads worth searching for. 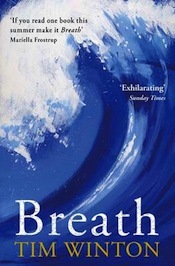 Breath is my favourite surf fiction book ever. It’s a coming of age story, in which Pikelet, a young boy on the West coast of Oz, discovers the thrill of surfing. As the title implies the book has a ‘breath’ theme throughout. As a kid, Pikelet and his best mate ‘Loonie’ would scare onlookers by seeing who could hold their breath underwater the longest. As a teen, the thrill of big wave riding caused a few heavy hold downs. And asphyxiation, resuscitation and didgeridoos all played their part in Pikelet’s adult life. With experience and emotion drawn from the West Oz ocean, Tim Winton has conjured mythical waves for all to enjoy in Breath. From the fun peelers at The Point to the mind-blowing gut-wrenching Nautilus, there’s something for every surfer to soak up. I’m currently reading this book for the third time. Kem Nunn’s Tijuana Straits and Tapping the Source, are also awesome surf books, far better than the usual surf fiction fodder. But Dogs of Winter is my personal favourite. 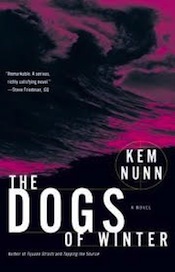 Kem Nunn writes surf fiction with a dark side, and Dogs of Winter is no exception. Terrible deaths, forbidden waves, local legends, crazed surfers and a washed up photographer, all stirred together in a remote Californian Indian reservation. If you haven’t read a Kem Nunn book, do yourself a favour and order one. Now. Go on then. 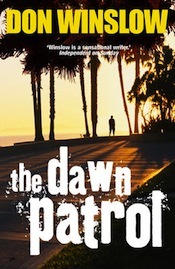 The Dawn Patrol is a little more light hearted, which comes as a welcome relief after the last two. But like most successful surf fiction, there is a sinister undercurrent. Boone Daniels is a P.I. in boardshorts based in San Diego. He’s a talented sleuth by trade but a devoted surfer by nature. Just as a once-in-a-lifetime swell is predicted to hit, so does a complicated case that Boone is compelled to take. Dead strippers, Hawaiian gangs and trafficked Mexican girls, cause the case to take a dark and unpredicted course. Boone gets sucked into an emotional whirlpool, from which only his Dawn Patrol buddies can rescue him. Will Boone catch the baddies and ride the giant swell, or will the case and his life get sucked into an eternal darkness? 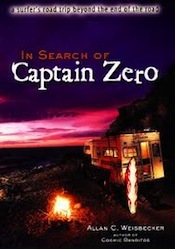 It’s hard to believe but In Search of Captain Zero is actually a memoir not a work of fiction. As Allan Weisbecker nostalgically recalls his drug smuggling mishaps, Mexican misadventure and a melancholy mission to find his old best buddy ‘Captain Zero’. From the safe haven of his seaside home in New York to the lawless limits of Central America. Weisbecker’s journey is packed full of deep thoughts, remote waves, colourful characters, and travelling challenges. His mission is to find long lost friend and fellow surfer Christopher Conner AKA Captain Zero. He fears Chris has ‘gone off the rails’. Considering the extraordinary lifestyles they lead together during the ‘good times’ this could be bad, possibly fatal. Hope is all Weisbecker has to go on. A true tale, of true surfers living exotic surfing lifestyles, but all good stories come to an end. 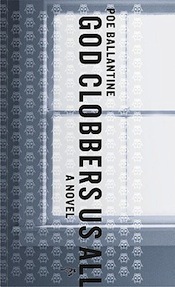 Thanks to a recent suggestion from @SeatownRockerz, the most recent addition to my bookshelf is God Clobbers Us All. Edgar Donahoe is an 18 yr old surfing fanatic and an orderly in a decrepit San Diego rest home during the 70s. Like every teenager, Edgar struggles with romance, death, friendship, and an ill-advised affair with the wife of a maladjusted war veteran. But things start to get really interesting when Edgar and his best friend Pat, a Blackfoot Indian, are held responsible for the disappearance of their fellow worker, Beverley Fey, after an LSD party gone awry. Ballantine delivers intelligently crafted prose, but his words are easily consumed and very moreish. A collection of short but genuinely amazing surf stories, from a fellow Cornwall dweller. Before I read this I thought Garrett McNamara surfing giant waves from crumbling glaciers was a hoax, and had no idea that ‘Kelly’ isn’t Slater’s real first name. I was expecting more ‘story’ if I’m honest, as all of these little surf gems are told in Alex Wade’s concise columnist style. But what I first thought a fault later became a strength, as each tale is quickly read, easily remembered and joyfully recounted. Amazing surf stories has given me more tales to tell with surfer friends than any other book. I discovered this one on a coffee table in Royal Cornwall Museum’s surfing exhibition (well worth a visit if you’re in Cornwall). Having read and enjoyed The Cloudspotter’s Guide, I walked over to Waterstones and bought a copy instantly. Gavin Pretor-Pinney is like your favourite teacher, father and mad professor all rolled into one. The science of waves can be a tough read, especially when you talk about every type of wave, wet and otherwise. However throw in hand picked quotes, heartfelt observations, simple diagrams and magical metaphors, and wave science becomes wave wonder. This fascinating, funny book will not teach you how to ride waves, but it will show you how to tune into the shapes, colours and forms of life’s many undulations. Christopher Snow is a 28yr old surfer who lives in Moonlight Bay, California. His claim to fame is also his curse, he suffers from – xeroderma pigmentosum (XP) – a real but rare condition causing light-sensitivity so severe he cannot be exposed to daylight. So Chris is a creature of the night – roaming freely through the town on his bike, surfing in the moonlight, exploring while most people sleep. Already weird enough to capture most peoples attention but the next 24hrs get freaky with mutant monkeys, bodysnatchers, murders and his father’s dying words ‘fear nothing’. Not so surf centered as the others, but enough to justify inclusion. 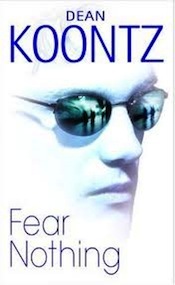 If you like Dean Koontz thrillers and surfing, you can’t lose. This is no ordinary collection of tall tales told by egotistical surfers. The Big Drop contains 32 true stories of legendary big wave adventures, throughout the evolution of big wave surfing. From the early days of Greg Noll at Waimea to modern day Mavericks, there’s a story for every generation of wave rider. The book’s focus on the early era of big wave riding during the 1950s and 1960s, demonstrate how times have changed, how far we’ve come in big wave surfing but also how brave and bold the first big wave surfers were. 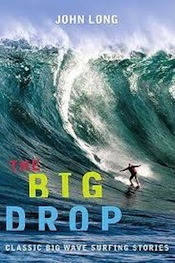 The Big Drop is an intoxicating concoction of charismatic characters with great names and great legacies, including Jose Angel who shouted at sharks, Ken Bradshaw who rode legendary Log Cabins, and Mark Foo whose life and death will be remembered forever. If you want to discover where big wave surfing began and what it’s all about, you can’t beat The Big Drop. Shaun Tomson should need no introduction, but in case you don’t know he’s a pioneering professional surfer from South Africa. At his zenith Shaun Tomson had won a World Champion title, setup a multi-million dollar surf clothing brand (Insight) and was an inspirational speaker. But then his 15 year old son Mathew died in a tragic accident. From his considerable experience of life’s ups and downs, Shaun has compiled ‘12 simple lessons for riding through life’ starting with ‘I will never turn my back on the ocean’. Shaun is not a modest man, and rarely misses an opportunity to recount his successes, but that makes his tales of loss more poignant. 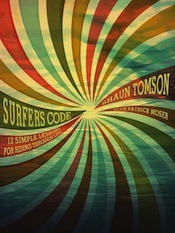 His code and lessons will certainly ring true for surfers young and old and are well worth remembering. As he says in his introduction “if a young surfer or anyone for that matter can read Surfers Code, learn some useful information, and ultimately get more enjoyment in and out of the ocean… then it will be the best thing I have ever done”. He may well be right. And finally if you’re new to surfing or want to learn more about surf spots along the coast of California, Wave Riding by Neil Grunig is well worth a read. I’m sure there are many more surfing novels to discover, so please send me your suggestions. Thanks for the suggestion, I will order Sly now. If it’s as good as you say I’ll no doubt wax lyrical about it here soon. Would you recommend any of there for a 10 year old very keen beginner? 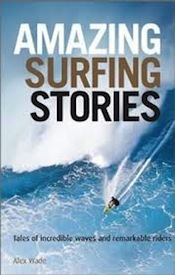 Amazing Surf Stories by Alex Wade is suitable for a young audience and should inspire any grom. It’s aimed at young adults so there might be unsuitable bits for a 10 year old. I guess it depends on how liberal you are and how mature the reader is. Not sure about Pier Rats, but I’d recommend the Lockie Leonard series which, incidentally, is written by Tim Winton, who wrote Breathe. Strongly recommended for a 10 yo. My son loved it. Thanks for the recommendations. I couldn’t find a copy of Sly, but will try again and look for some Lockie Leonard while I’m at it. Right I’ve just ordered two Lockie Leonard books, but can only find a Kindle version or £20 used copy of Sly. So if anyone knows where I can find a reasonably priced paper version of Sly by Rick Feneley please let me know. My novel, Rocketbar Amicus (On-Demand Publishing 2012), is sci-fi dealing with ending dystopias when they crop up. The story has a light-hearted tone. This is a future where surfing leads all other sports and pastimes. While not on our surfboard building site, the work is on Amazon.com, Kindle, and others. I signed the story up a for a movie deal in 2014 with an independent U.S. company. Great list! Breath and Captain Zero are two of my favorites as well. Caught Inside by Daniel Duane is a must-read if you have not read it yet. Hi Kevin, I was loaned a copy of Caught Inside but I never finished it. For whatever reason (can’t remember now) it didn’t grab my attention. I’ll give it another go soon. Yeah, I am about a third of the way into Barbarian Days and am thoroughly enjoying it. I’m kind of surprised that it won the Pulitzer though. Give Caught Inside another chance. It is excellent in my opinion. A book about surfing won a Pulitzer! Yeah that is surprising. I guess he’s very well connected. Definitely gonna have another go at Caught Inside now. Thanks again. Great List. Thank you. I also give Barbarian Days: A Surfing Life by William Finnegan a big ‘yes’ – it pulls surfers and non surfers alike through a life journey that is both bone blasting and, somehow… mellow. On a private stretch of remote California coast a surf obsessed teenage boy and a hateful old rancher face off. They have only one thing in common — an innocent young cowgirl. Stoker seems to only care about catching waves and the lobster poachers who are stealing from his traps, but is somehow reluctantly tied to all of the unfolding events. Many of the scenes in this fictional story are based on true stories as told by Hollister and Bixby Ranch surfers. Readers will find “The Last Holdout,” a bonus collection of interviews with the original Hollister and Bixby Ranch surfers, at the end of this story. Hi Dave, your new novel Loaded Barrels looks interesting. Let me know when and where it’s available to buy in the UK. Thank you for compiling this great list of surf books! I’m a surf writer, too, and I hope you’ll consider adding my book, Chasing Waves to your list. It’s a surf travel memoir told from a woman’s perspective. It came out in 2009. It’s available on Amazon. You can also read about my new book, which is being published May 9th, 2017, on my website: http://www.amywaeschle.com. It’s a novel called Going Over the Falls. It’s a surf adventure crossed with a family saga. I’m excited to see a lot of surf books I hadn’t seen before here. Especially the ones for kids. I have two daughters and my oldest loves the water and is starting to surf. My youngest is a thinker and quite timid, so will come to surfing in her own time. Our whole family loves to read as well as spend time outside. I will have to figure out a way to get some of these UK published books…they will be thrilled! I loved reading about your travel tips and experiences. I’ve joined your newsletter so we can stay in touch. I’m a wave-starved mama, so I can relate to your life! Many thanks for putting together a great website dedicated to surfing. And please do retry Caught Inside, it’s one of my favorites, and Dan has become a good friend over the years. A very humble and talented guy–he’s since become a dad, too, though he’s not so wave-starved as he lives near the beach in the San Francisco area. Thanks for taking the time to comment and share. Your books, family life and adventures sound fantastic. 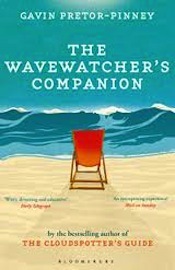 I look forward to reading Chasing Waves and Going Over the Falls soon, and when time permits I’ll post a review. Good luck with the new novel and teaching your daughters to surf. I’m planning to post a few tips on teaching kids to surf soon, so if you have any advice to share let me know. FACT: You can surf in Dubai!